Stuart Lancaster should be retained as England head coach despite their early exit from the World Cup, says ex-New Zealand and Wales coach Graham Henry. 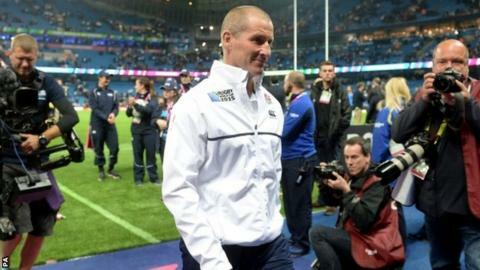 Lancaster's future has been the subject of constant speculation since the 46-year-old's side became the first World Cup hosts to exit at the pool stage. "He has got the ability - it's a no-brainer to me," Henry, 69, told BBC Radio 5 live's Sportsweek programme. "Stuart is a good man and has produced a side with good values." Lancaster, who was appointed in 2011, came into the World Cup having overseen three successive second-place finishes in the Six Nations. England's failure to reach the quarter-finals - following defeats by Wales and Australia - has led to calls for him to leave his post. The review of England's campaign will begin on Monday, with the Rugby Football Union adamant the future of Lancaster - who signed a new six-year contract in 2014 - is yet to be decided. Henry, whose New Zealand side lost in the quarter-finals of the 2007 tournament before winning the competition four years later, believes the RFU should stand by Lancaster. "All professional sporting coaches who have been in their job for a while have rollercoasters," he said. "Those times are extremely difficult and I can empathise with Stuart. "I hope Stuart stays because you learn a lot more from tough times." Martin Johnson stepped down as England manager in November 2011 after a World Cup quarter-final defeat by France. Henry added: "I thought that was wrong. He hadn't got experience and would have grown a great deal. Too often we burn our coaches because it is public opinion and media opinion. "Continuity of people is critical if you want to produce something special. They know where they have been and where they are at and what they need to do to get better. "If you bring a new person in, it starts all over again and takes someone two or three years to get their feet under the table and feel comfortable in the job."